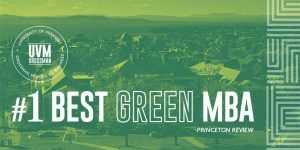 This post was written by Jeffrey Lue ’19. EDITOR’S NOTE: For an enhanced experience with this post, please take a listen to this 1990’s throwback. 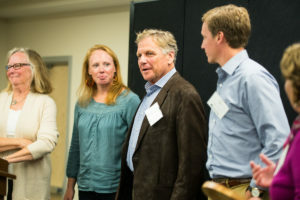 The Sustainable Innovation MBA Advisory Board member Don Droppo, CEO of Curtis Packaging (and UVM ’96) accepted the U.S.-based Multi-Generational Family Enterprise Award. It’s a rare condition, this day and age, to find emphasis being placed on the importance of family businesses. 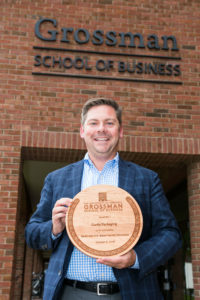 But at the Family Business Awards in early October, the Grossman School of Business and supporting community has the opportunity to acknowledge family businesses who are leaders in their respective industries. This year, we celebrated Lake Champlain Chocolates, Curtis Packaging, and Foster Brothers Farm / Vermont Natural Ag Products Inc. for their innovation and commitment to sustainability. Hearing the stories of the three 2018 winners and their 2017 counterparts were a beautiful example of love and tradition of the grand design. Since 1983, Lake Champlain Chocolates has been aspired to providing extraordinary chocolate moments. In addition to creating wonderful chocolates, LCC has demonstrated their commitment to sustainable business practices with their certifications (B Corps, Fair Trade) and community service. 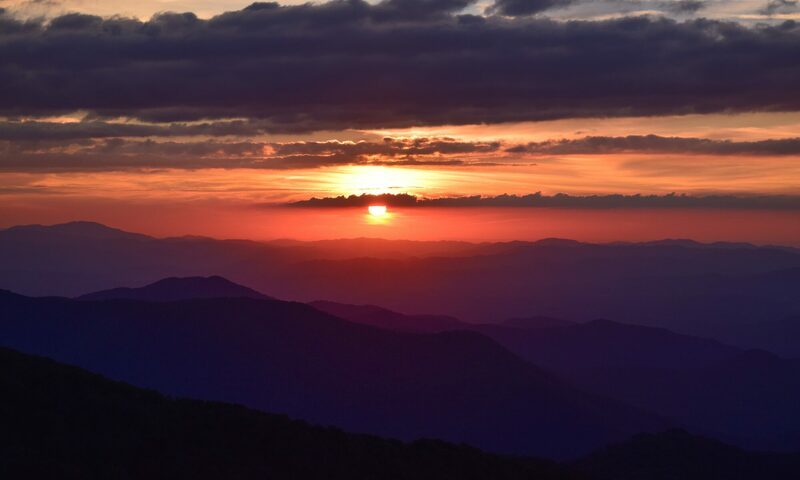 It’s impressive enough to find a business in operation since 1845, but some people say it’s even harder to find one with the vision to incorporate environmental stewardship into its core competencies after all those years. Curtis Packaging achieved both accolades, becoming the first packaging company in North America to use 100% renewable energy, be carbon neutral, and a zero-waste-to-landfill facility. The Lampman family of Lake Champlain Chocolates. What’s the secret to the success of these small businesses? Well there must be some magic clue inside these gentle walls in the new dairy barn at Foster Brothers Farm. This fifth-generation farm has innovation engrained in their DNA. They built one of the first of New England’s methane digesters back in the early ’80s, expanded their portfolio to include an organic line of compost (MOO), and recently implemented a heat recovery system designed to capture and repurpose the heat created during the aerobic composting process. These families are an inspiration of how business should be done. At today’s ceremony, there was real love burstin’ out of every seam of Ifshin Hall, and it was clear to see that it’s the bigger love of the family that will keep these businesses going strong. Congratulations again to all the 2018 winners! Feedback is the breakfast of champions. Feedback is a gift. Without feedback, leaders are cut off from the lifeblood of an organization and their ideas and abilities will wither and die. 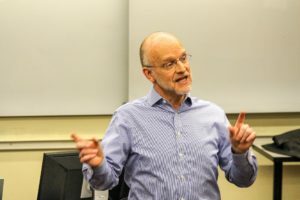 These are the words of Joe Fusco, Chair of The Sustainable Innovation MBA Advisory Board and leadership coach to our cohort. Every other week we meet with Joe for the program’s Leadership Seminar, and even though it’s an optional supplement to our other rigorous coursework, everyone shows up ready to listen. We spend a lot of time in the program filling our minds with financial equations, S.W.O.T. analyses and Organizational Behavior terminology – preparing to be the executives of the organizations of tomorrow. The leadership seminar is different: Joe helps us go beyond our textbooks to look at what true leadership really means. 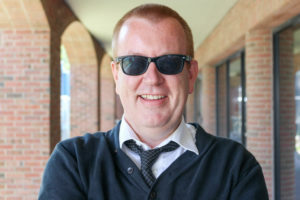 Joe helps us to examine what our heads, hearts and hands are doing on a daily basis and how these cognitive, emotional and physical practices and abilities are impacting others. Impact is the key. It doesn’t matter our intentions: what matters is the effect that our actions have on others. The best way to assess our impact is to be open to receiving feedback. Feedback allows us to see the difference between our intents and impacts, and work on closing the gap. However, being open to feedback isn’t easy and it means addressing the natural — and sometimes quite strong — defensiveness that can pop up when hearing things about ourselves that don’t jibe with our own internal assessments. Leadership Seminar has no grades and no required homework, which makes what we volunteered to do for Joe even more striking. He challenged us to complete two difficult assignments. One: come up with a list of 25 strengths and 25 weaknesses that we bring to the table as leaders. Two: ask someone who knows us well to create the same list for us, and then sit with them while they read it out loud. The impact? As scary as this assignment seemed, it made each and every one us more receptive to learning about the behaviors and skills we need to work on in order to become more effective leaders. 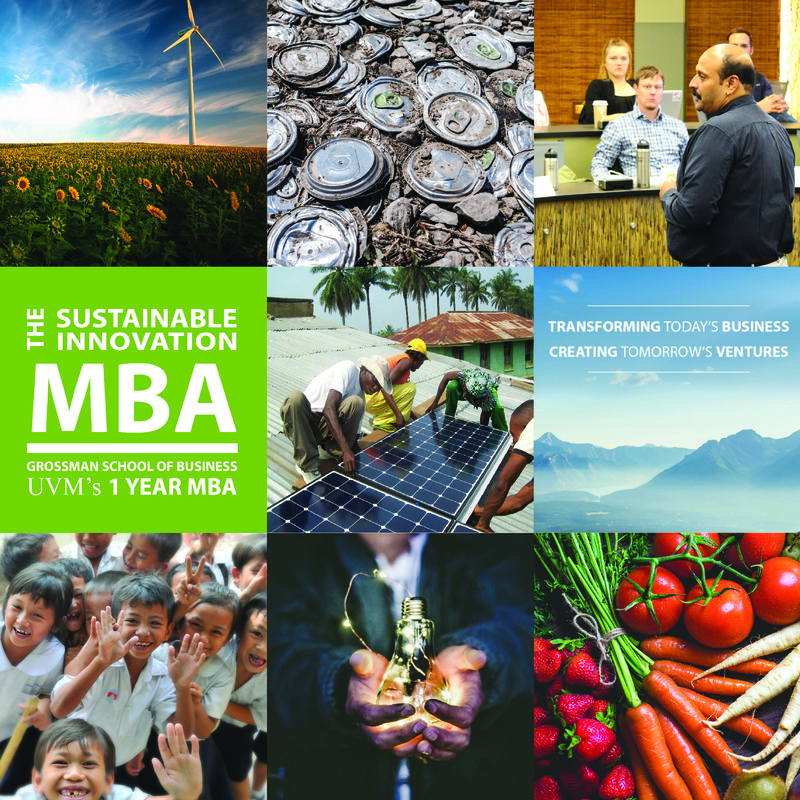 This lies at the heart of what we all came to The Sustainable Innovation MBA to learn. 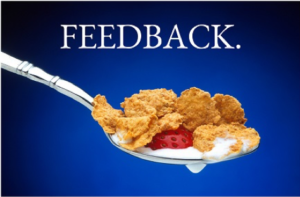 Wake up every morning and get hungry for a big bowl of feedback, folks. It’s the breakfast of champions. It’s popular to think of the 1960s and 1970s as a time when the hippie and counter-culture movements found and flooded Vermont — “turn on, drop out” and all that. Lesser known is the history of that time when, although many moved to Vermont to find and build a different way to live, a number also were inspired to find and build a different way to do business. Some of Vermont’s most iconic brands — like Ben & Jerry’s and Burton Snowboards — were born out of this spirit, and have set the standard for an approach to business that emphasizes multiple bottom lines. 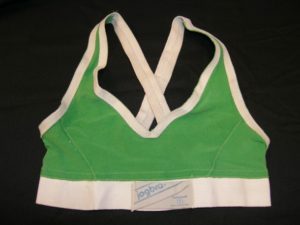 The Jogbra, which revolutionized women’s sports and is in the permanent collection at the American History Museum at the Smithsonian Institute, was invented here in Vermont in 1977. 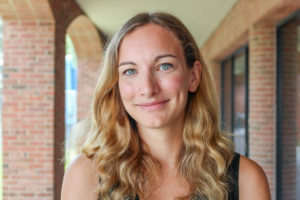 One of the inventors, Hinda Miller, is a member of The Sustainable Innovation MBA Advisory Board, and is very active in helping our students think about and launch careers in sustainable, innovative businesses. Listen to Hinda — trained as a theatrical costume designer — talk about her Vermont entrepreneurial awakening in this podcast produced by the Vermont Historical Society, the Vermont Humanities Council, and VTDigger. Recently Laura Asiala, Senior Fellow at PYXERA Global and a Sustainable Innovation MBA Advisory Board member, joined this year’s cohort for an in-class discussion on the role that business can play in addressing some of the world’s most intractable challenges. Before joining the PYXERA team, Asiala had been the Director of Corporate Citizenship at Dow Corning Company. Over three decades in the corporate sector taught her that environmental and social sustainability are not hindrances to business; rather, they can ensure long-term success and profitability. She carries that vision forward in her current role at PYXERA, where she works to leverage the strengths of corporations, governments, social sector organizations, educational institutions, and individuals to solve complex problems in inclusive and sustainable ways. Of particular interest to Asiala is how corporations can and must play a role in achieving the United Nation’s Sustainable Development Goals (SDGs), also known as the Global Goals. Adopted in 2015, the Global Goals identify specific targets and timelines that aim to end poverty, protect the planet, and ensure prosperity for all. 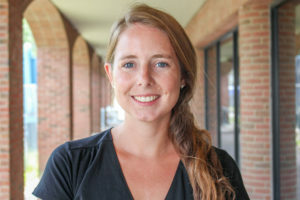 At PYXERA, she is working on aligning multi-sector stakeholders toward those ends.